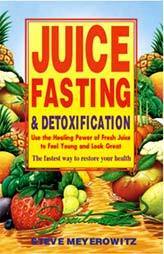 Juice Fasting & Detoxification by Steve Meyerowitz - Penn Herb Co. Ltd.
Fasting and juice therapy revamp your health from the inside out. This books shows you how to tap that power and how to fit it into a busy lifestyle. It's easier than you think. Give your cells and yourselves the opportunity to cleanse, nourish, rejuvenate and heal.